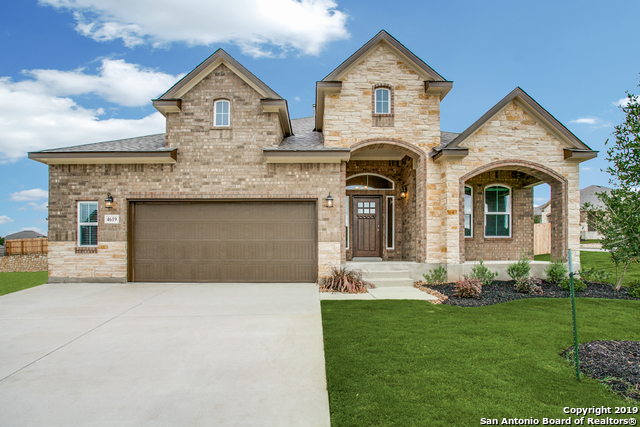 All SANTA MARIA AT ALAMO RANC homes currently listed for sale in San Antonio as of 04/24/2019 are shown below. You can change the search criteria at any time by pressing the 'Change Search' button below. 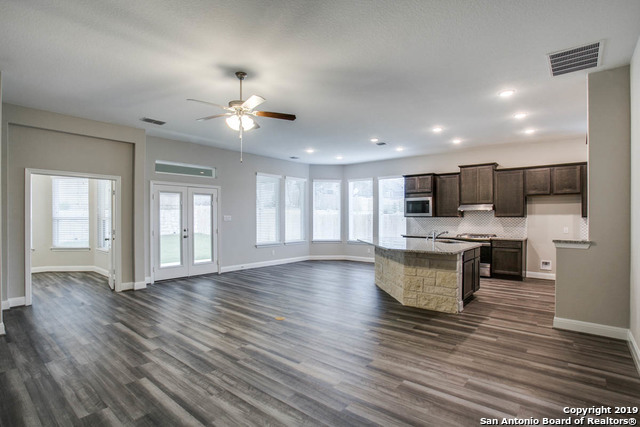 "Stunning single story home w/signature stainless steel appliances, trendy 'white' color kitchen cabinetry, granite kitchen counter-top, 6' garage extension, & double glass doors leading out to relaxing covered patio overlooking beautifully treed lot. 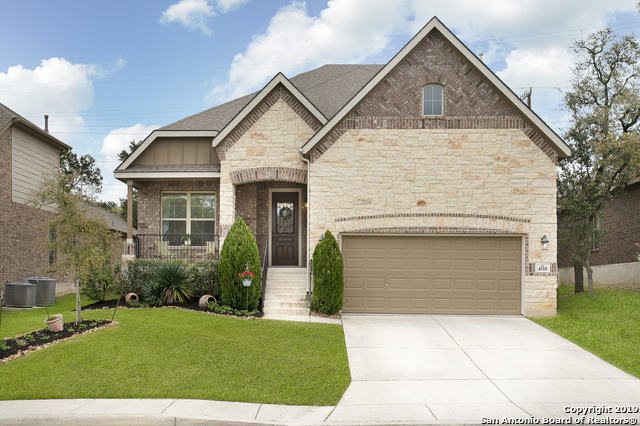 Full sprinkler, blinds throughout, just like you would expect w/any Chesmar Home! Master retreat boasts Texas-sized walk-in shower, his & her vanities, & walk-in closet. Come visit Santa Maria today! **SOME PHOTOS OF SAME PLAN, NOT ACTUAL HOME**"
"WAS $388,305, NOW $378,130! Popular floor plan w/an oversized garage located on a CORNER LOT! Open concept living at its finest w/a large granite kitchen island overlooking family room featuring tall ceilings. Master retreat boasts a beautifully tiled, Texas-sized walk-in shower, his & her vanities, PLUS his & her walk-in closets! 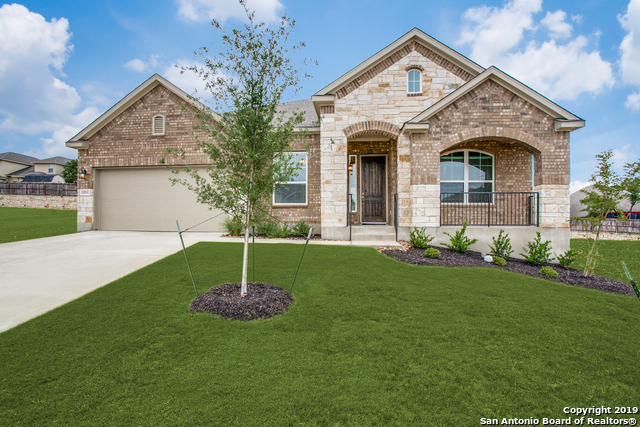 Covered patio, full sod & sprinkler, & blinds throughout - just like you would expect w/any CHESMAR HOME! **SOME PHOTOS SAME PLAN, NOT ACTUAL HOME**"
"Popular floor plan w/an oversized garage! Open concept living at its finest w/a large granite kitchen island overlooking the family room featuring tall ceilings. Master retreat boasts a beautifully tiled, Texas-sized walk-in shower, his & her vanities, PLUS his & her walk-in closets! Covered patio w/privacy in back, full sod & sprinkler, & blinds throughout - just like you would expect w/any CHESMAR HOME! Come visit Santa Maria today at Alamo Ranch today! **INTERIOR PHOTOS SAME PLAN, NOT ACTUAL "
"WAS $380,130, NOW $369,990! 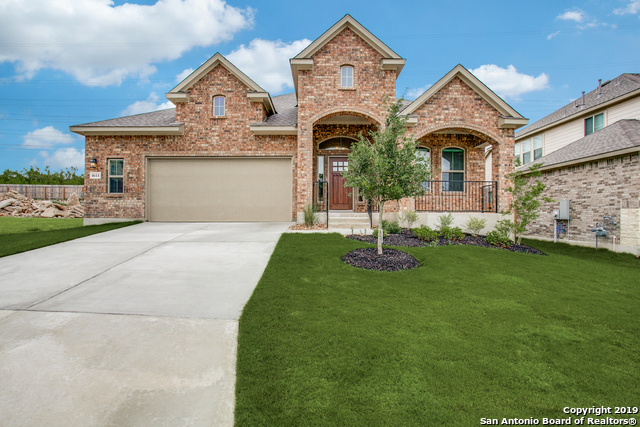 Incredible, NEW single story floor plan designed w/family in mind. OPEN concept living w/large granite kitchen island overlooking family room w/vaulted ceilings & amazing views! 4 beds/3 baths & a flex room off of the secondary bedrooms. Master retreat features walk-in closet, his & hers vanities, and Texas-sized walk-in shower. 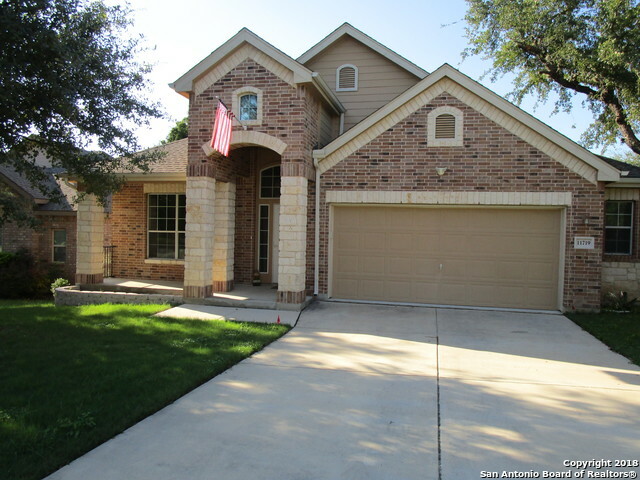 Full sod/sprinkler, blinds throughout - just like you would expect w/any Chesmar home! **SOME PICS SAME PLAN, NOT ACTUAL HOME**"
"MOVE-IN READY! WAS $379,990, NOW $369,990 GOURMET kitchen! ENTERTAINER'S delight! This 1.5 story home features an OVERSIZED OUTDOOR living area, 3-CAR garage, 4 beds/3 full baths. Full SOD/SPRINKLER, 2 blinds throughout - INCLUDED, just like you'd expect in any CHESMAR home. Come visit Santa Maria today! 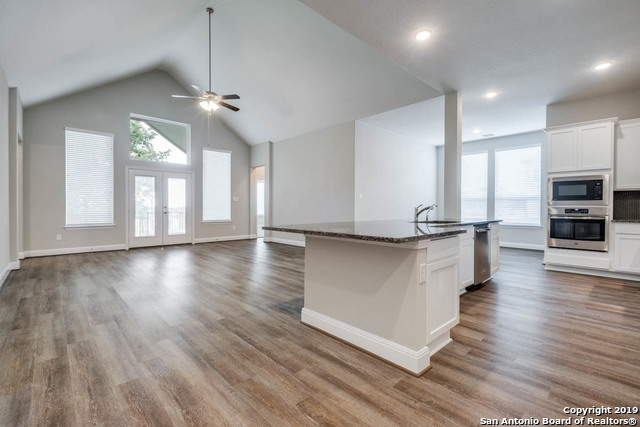 **OPEN HOUSE SUNDAY, APRIL 21st 2PM-4PM**"
"Brand new floor plan gives the best of both worlds! 3 Bedrooms down, to include Master bedroom & full bedroom w/game room & bath upstairs. Gourmet kitchen perfect for entertaining and lots of natural light. Huge covered patio! All the extras that you love with a Chesmar Home! Come by today to view this sure winner of a design!" "Executive 1 story Wilshire Custom Home, move in ready! Fresh Paint, New Carpet, Hardwood Floors, Granite Counter tops, Stainless Steal Appliances, Functional 4 Bedroom, 3 and a half bath layout with 3 car garage, Well Located on Greenbelt lot. Seller will consider contributing towards buyers closing costs with the right offer. This home is a Must See! Hurry!" "Wonderful home with hardwood flooring and 18 inch tile throughout home*NO CARPET*Most of living downstairs*Upstairs 2nd living area with full bedroom and bath*Open living space*Gorgeous kitchen with granite island kitchen and gas cooking*S/S appliances*Great counter space*Wood stairs with iron baluster railing*Relax in spacious master bath with separate shower*Huge master closet*Oversized garage with shelving*Water softener*Covered deck*Nice sized front covered porch to enjoy in evenings*Move-in"
"BEAUTIFUL & WELL MAINTAINED 1.5 STORY LOCATED IN ALAMO RANCH. THIS SPACIOUS 3 BED/ 3 BATH WILL GREET YOU WITH AN OPEN FLOOR PLAN WITH HIGH CEILINGS. THE MASTER HAS A HIS & HERS CLOSET WITH CUSTOMIZED CROWN MOLDING & TRAY CEILINGS. UPSTAIRS YOU WILL FIND AN EXTRA LARGE GAME ROOM WITH A FULL BATH FOR CONVENIENCE. THIS HOME HAS 2 PATIOS WITH ONE FACING A PRIVATE GREEN BELT, PERFECT FOR RELAXING. THE AMENITY CENTER ALSO OFFERS A PLAYGROUND, POOL & MUCH MORE. COME VISIT THIS LOVELY GEM BEFORE IT'S TO"